If you're on the blogs Facebook page you may have already seen the excitement that occurred in our front yard this afternoon. It began when I was in the kitchen cooking dinner. Paul was talking to me when Sadie appeared in the doorway and said "Mommy, Daddy, there's a bag in our front yard!" "And a fire! And someone knocked on our door!" 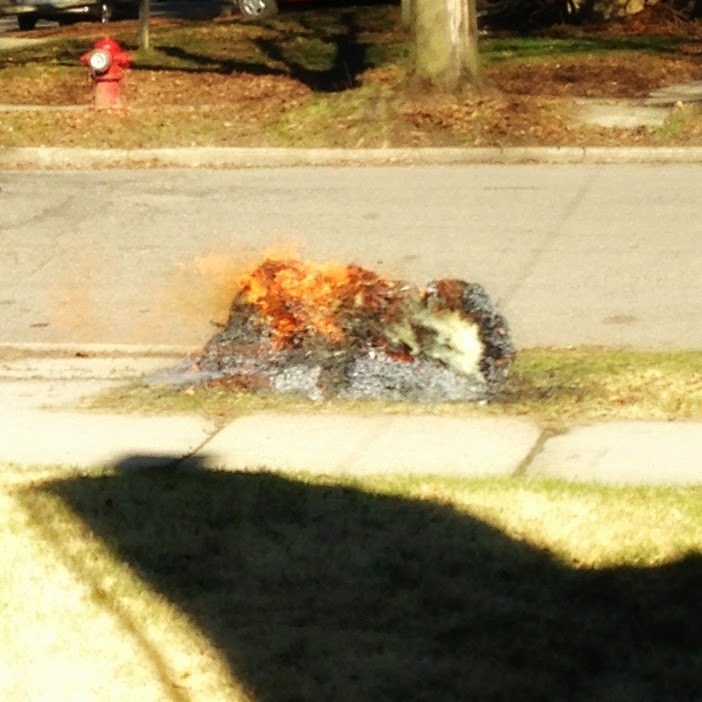 Those would be the five bags of leaves that we'd raked up off the lawn (so far) fully engulfed in flames. When I was a kid we had a load of alfalfa in the back of my dad's truck that got rained on before we could get it covered. Later, when the sun came out, it started to smoke and I had a few panicked moments of thinking that the same thing had somehow happened to our leaves, and I had visions of getting some sort of gigantic ticket for recklessly leaving the leaves outside after it rained (I know, I know it sounds crazy, but our city is fond of giving out tickets.). As I returned from the back yard with a hose, Paul tried to keep two little preschool boys who live a few houses away from getting too close to the flames, and a neighbor explained that a girl had walked down the street lighting the leave bags that were set out waiting to be picked up on fire as she went. Another neighbor had chased after her and she'd taken off running. Ours was the only one that really took off. And I spent the rest of the evening reassuring Sadie that everything was okay and that no the person who did that wasn't going to come back and start anymore fires, as she fretted and fretted over whether the person who'd started the fires had been caught. What a week this has been. I'm thankful that there are only two hours left until a new one begins! Bring on Divine Mercy Sunday!